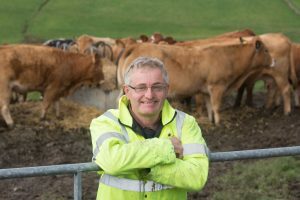 Ensuring beef and lamb farms around the country are continually improving efficiency and productivity is the main aim of AHDB’s Strategic Farm network. 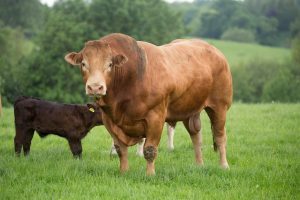 Set up in late 2017, the project now involves 12 beef and lamb farms across England all looking to make improvements to their enterprises with the help of AHDB’s knowledge exchange team and consultants. 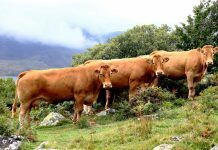 Two of the farmers have Limousin cattle and both are looking to make improvements to areas including grassland management, productivity, breeding and herd health. Over the next two years, both farms have committed to implement changes and track their progress against objectives. Farming Limousin cattle in Country Durham is David Monkhouse. David has both sheep and beef, with a herd of 80 pure and cross Limousin, Shorthorn and Parthenais cows and four bulls. David’s main aim when he joined the strategic network was to use the opportunity to experiment with new technologies on the farm in order to enhance current practices. Working with TruTest, AHDB installed weighing facilities on all of the strategic farms to encourage the practice of regularly weighing cattle to monitor performance, growth weights, sucker cow efficiency and raise questions around diet. “I’d not needed to weigh the cattle before as we tend to sell young stock as stores and therefore sell by head. I’ve kept an eye on how they are growing, but you can only tell so much by eye so I knew we’d get a more accurate picture of how they were doing if we started to regularly record their weights,” explains David. David noticed the discrepancy and discussed the problem with his consultant. He realised that having the heifers in one large group meant there wasn’t enough feed space available for all to feed at the same time, meaning the less dominant animals were not meeting target growth rates. “We split the groups up in January and took the 12 biggest heifers to another shed. This increased their feed space and gave them the opportunity to improve their daily live weight gain. When we re-weighed in March, they were hitting target growth rates of 0.94kg per day,” explains David. Now growth rates are tracked, David has been able to address his target of reducing his calving age to two years of age. This has advantages for suckler producers including increased cow productivity over their lifetime and reduces the number of stock on farm, therefore reducing the resource requirement to feed and house stock. “When we weighed the heifers that were due to bull in spring 2018, we realised they were already at 90 per cent of mature cow weight and so should have been calving rather than just going to the bull at two years of age. Weighing the younger heifers has allowed selection of better-performing heifers to be kept as future replacements that will calve successfully at two years of age. “Weighing equipment has given us more control of our heifer rearing programme and helped us to track progress of our growth rates rather than just making assumptions as to how the herd is doing. We’ll now continue to monitor the weights and it’s something I’m looking to now implement for our sheep enterprise,” explains David. 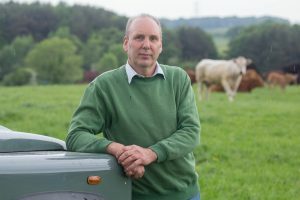 Farming 154 ha in Kirkhouse, Cumbria, Edward Dean has a beef and sheep enterprise, with a flock of 300 Texel ewes and a herd of 130 Limousin and Limousin-cross suckler cows. 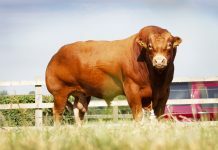 Also on farm are four Limousin bulls, one of which, Copperhurst Ike, was bought earlier this year. Focusing mainly on his suckler enterprise, Edward is looking to make sure he is utilising his grassland and breeding replacements with good genetics in order to maintain high herd health and produce animals that hit target specification. Edward’s father ran the farm as a dairy enterprise until 2001, when foot and mouth ended dairy production. A decision was made to then change the focus to beef production and now Edward sells his young stock as stores at 12 months through the local auction market. Over the last five years, Edward has also been using Artificial Insemination (AI) to breed more replacements. As a strategic farmer he’s now got the opportunity to look at improving conception rates by installing heat detection software. This is something which is often used within the dairy industry, but less so in the suckler industry and will help ensure cows are served at the optimum time.